Okay, okay, I admit it~ I'm a flake! I'm totally late to my own party. Again. Although to be fair, I'm on Pacific Standard Time and all you other people get up way too early. It's only 7:30 a.m. here. Me being late has absolutely nothing to do with the fact that I've fallen into a couple of good books over the last couple weeks and have been staying up way too late reading. No, it definitely has nothing to do with that. I met a new neighbor this week. It's pretty unusual for me to get a knock on the door in the middle of the day, especially when it's not Kirby Vacuum season, so I was not prepared. I first had to move 25 shoes from behind the door just so I could open it, and when I did there was a nice lady on my porch holding out what appeared to be a plastic bag. "You have a bunch of little boys right?" And I started to get nervous. "They left these socks in my yard the other day when they were catching grasshoppers." "My kids were in your yard?" "Oh yes, I looked out and saw all these little blonde heads bopping around on my grass. They come down a lot. It's no problem, I just thought you would want their socks back." I'm still trying to process the fact that I have no idea when my kids escaped my vigilant supervision long enough to run down the street and become grasshopper vandals, let alone take the time to strip down to bare feet and get comfortable. And so it begins.....I've been making a lot of zucchini bread lately and it is delicious. Rowan loves it the most, and calls it Kini Bread. And I do not correct him, because that is funny. My two-year-old is torturing me. He vacillates between belligerence and effusive love. When he gets mad at me, he looks for the nearest chair, stool, or high chair and pushes it over. Kaboom! If I taught him to yell "TIMBER!" it might even be funny. Right now, it's just... torture. The other day he tried to lift up the coffee table so he could throw it like the Incredible Hulk. I kid you not. Luckily for me he couldn't lift it more than a couple inches. I am trying to remember that this is a season, a short season, and he will never again be as little as he is right this moment. "B, please, you're torturing me." No joke, just as I was writing that, one flew by my head. I have a bad case of blender envy. I've been stalking Costco's website, waiting for them to announce when the next Vitamix demo was coming to town, for the last three or four months. And then the other night I found out it's going to be here in two weeks. And I forgot that we do not have any money. I forgot that we are trying to pay off our debt before winter so we can be responsible little squirrels, blah blah blah. I had the American Express website open and I was filling out an online application before I knew what I was doing. And I got down to the last line, where I just had to enter my Costco membership number, and I got the first pangs of conscience. I'm just going to sign up for an American Express card real quick and buy this one thing but then we'll pay it off and I'll cancel the account, I swear." So, I threw a matchbox car at him and pushed over a couple stools and a highchair and pouted for the rest of the night. But the next day, when my Blender Envy Haze had faded a bit, I realized he's a lot smarter than me and I was again grateful that he's here to be my rudder. I was relieved that he is here to be my rudder, because we all remember the incident with the electronic pressure cooker and QVC right? No? Oh, well remind me to tell you about it some time. I would still very much like a Vitamix blender, though. Vitamix, can you here me? For the record, I didn't really push over stools or throw a matchbox car at Jarrod's head. I did think it though. What books? I need some good titles! I often throw cars and other paraphernalia (spelling?) at my husband's head too. Keeps him in line. 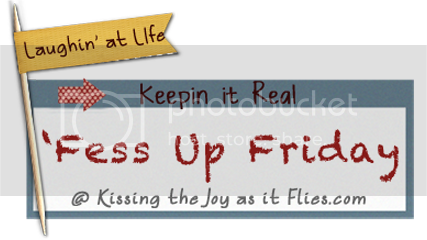 ok, i could never link up to your fess up friday's because your are just too darn cute! love love love them. have a great weekend. Love the neighbor that you don't know bringing dirty socks back! That's completely awesome. Okay, well I need to go since everyone is STILL not finding library books and the fighting is escalating. I laughed out loud picturing them taking off their socks in the midst of grasshopper catching. lol. oh tantrums. trus just started them and NO fun. only a phase only a phase. my preschooler is still in tantrum mode, though he poses more of a risk to himself rather than household items - serious, that kid has the most amazing 'death drop' - but his most lethal weapon is his VOCALS - he's a teeny tiny guy, but he's got lungs! good thing they're so darn cute, huh? i love the sock story. also, i have a vitamix from costco. i love it. but def not worth it if is stressful to the finances. Ya, I'm waiting for those book titles! This post was great....that is so funny with the bag of socks! My oh my! I had a tantrum the other day! Okay, so it was yesterday! I threw toys down the stairs in hopes they would break and screamed at the top of my lungs for long enough that my throat hurt. Admittedly I totally caused my littlest guy to wail uncontrolablly because he couldn't see mama, but he could hear mama and mama was being very mean in what she was saying and why won't mama come down the stairs and just hold me because I'm so SAAAAADDDDDD!!!!! So if you did actually throw the cars and push over the chairs and tables, it would make me feel a lot better! Oh man, Gianna, I have totally had days like that. There is nothing worse than having a self-inflicted sore throat from yelling. Because then you feel like a total idiot on top of feeling like a bad mom *sigh* Been there! And the book that I was reading is called "Daughter of the Forest" by Juliet Marillier. I thought it was historical fiction but it wound up being like historical fiction/fantasy because it was based on a Celtic fairy tale. I really really liked it, although it did make me cry. It's not a 'feel good' read but it was beautifully written and the author really made me believe it. Two thumbs up. Thanks for all your sweet comments guys! My boy is in the tantrum mode too. Sometimes I feel like I am the only one who has such a crazy little man in my life... it is comforting to know that I have some company! :) Misery loves company right?! The sock story still has me smiling! You have such fun 'Fess Up posts! I do think about pushing over stools and throwing stuff too. Just thinking about it even helps some. Possibly! Love your blog and looking forward to reading more.